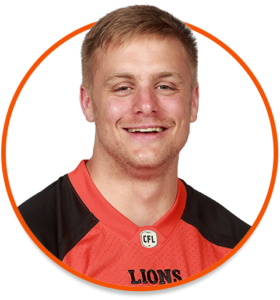 The BC Lions selected Dakota in the sixth round (51st overall) of the 2017 CFL Draft. 2017: Another contributor from the club’s productive 2017 draft class, Dakota suited up for eight games and spent the remainder of his rookie season learning his craft on the practice spot. All of his game action game on special teams. 2013-2016: Dakota strung together an impressive four-year career with Mount Allison, establishing himself as their top receiver during his final two years. Across 29 games with the Mounties, Dakota snagged 91 passes for 1,103 yards and five touchdowns. Dakota broke out during the 2015 season, compiling 490 yards on 39 receptions with one touchdown. He built on those numbers in 2016, reeling in 41 passes for 462 yards and four touchdowns. Dakota majored in History and minored in Canadian Studies at Mount Allison. He says winning the 2014 AUS Championship with the Mounties is his proudest moment on the football field. Dakota enjoys listening to hip-hop and R&B, citing Drake as his favourite musician. Dakota never leaves home without his camera and loves photography, particularly taking pictures of landscapes. After hanging up his cleats, Dakota plans to be involved in the fitness industry and run his own business.